A 10:30 p.m. phone call in March 2008 shattered the peace of the Bowser family’s home in Butler, Pa. Shannon Bowser, 15 – a healthy teenager who loved playing volleyball and softball – had gone with some friends to a concert in New Castle. Now one of the friends was calling to say Shannon had a seizure and was being taken by ambulance to a local hospital. Shannon’s parents, Lisa and Ric Bowser, immediately got in their car and drove to the hospital emergency room in New Castle. A computed tomography (CT) scan revealed a bright area, indicating a mass of some sort, on the right side of Shannon’s brain. The next step would have been to do a magnetic resonance imaging (MRI) scan to better characterize the mass, but the New Castle hospital didn’t have an MRI machine. So in the early hours of Sunday morning, with her mother beside her, Shannon was transferred by ambulance to Children’s Hospital of Pittsburgh of UPMC, 60 miles away. Shannon’s father, his mind racing, followed the ambulance by car. The MRI at Children’s Hospital revealed some bleeding in Shannon’s brain. It showed the mass to be not a brain tumor but a cavernous malformation – a tiny clump of abnormal blood vessels – near the surface of Shannon’s brain. Although doctors can’t be absolutely sure, it’s possible the malformation had been there since Shannon was born. Some people have such malformations all their lives without any problems, but if one of the tiny blood vessels bursts it can set off a chain of events that results in a seizure. For the next several months, the antiseizure medication that doctors at Children’s prescribed for Shannon seemed to be working – she had no further seizures. She was doing so well that when the Bowsers proposed taking a five-week driving trip to Alaska in the summer of 2008, Shannon’s doctors had no objection. The family made it to Alaska without incident, but on the way back Shannon had another seizure. After that, her seizures began to occur more frequently. Some were “kind of a blank look, lasting 30 seconds or less,” said her mother. At other times, Shannon’s whole body would shake for several minutes. These full-body seizures always happened early in the morning when she was lying in bed. Shannon’s doctors prescribed a second antiseizure medication to keep her seizures under control. It worked. On her 17th birthday in August 2009 – seizure-free for more than six months – Shannon was able to get her learner’s permit and start taking driving lessons. But both the doctors and Shannon’s parents were concerned about possible long-term adverse effects from the medications. Side effects may include sleepiness, slowed thinking, and learning problems. The medications can also cause birth defects, which would be a problem if Shannon were to marry and want to start a family in the future. After being weaned off her antiseizure medications, Shannon was hooked up to a video monitoring device via electrodes on her scalp to measure electrical activity in her brain. She also had a special type of CT scan that helps to locate the source of seizures by identifying patterns of blood flow in the brain. The results of these tests indicated that Shannon’s seizures did seem to be coming from a focal point on the right side of her brain. Next came a test to determine where in Shannon’s brain certain speech, memory, and thinking functions resided, to minimize the chance that surgery might affect those functions. In most people, speech is controlled on the brain’s left side. For a small percentage of people, though, speech resides on the brain’s right side. Because Shannon couldn’t speak during her seizures, doctors were concerned she might be one of that small percentage. But the test confirmed that Shannon’s ability to speak was controlled on the left side of her brain and would not be affected by epilepsy surgery on the right side. The doctors recommended that Shannon undergo a two-part procedure called brain-mapping surgery. In the first part of this procedure, electrodes placed on the surface of the brain generate electrical signals that enable doctors to precisely pinpoint the seizure focal point. In part two, the seizure focal point is cut out of the brain. Shannon’s surgeries were performed by Children’s pediatric neurosurgeon Mandeep Tamber, MD, PhD. The brain mapping revealed that the focal point of her seizures wasn’t her cavernous malformation but another area of the brain a few centimeters away. So in the second surgery Dr. Tamber removed two pieces of Shannon’s brain – the malformation, just over half an inch (1.5 cm) in diameter, and a second piece, about two inches (5 cm) in diameter, next to the malformation, which the brain-mapping procedure showed was the area of brain generating her seizures. Shannon has been seizure free since the surgery in February. Her blonde hair has grown back to cover the incision on the right side of her scalp. Her postoperative MRI showed that the abnormal areas of her brain had been completely removed. A follow-up EEG in August revealed entirely normal electrical activity in her brain. If Shannon continues to progress well, by next March she should be able to discontinue the medication. “We usually keep patients on medication for a year to give the brain a chance to completely heal,” says Dr. Holder. “Shannon has done fantastically well,” says Dr. Tamber. Shannon’s mother agrees. “It’s amazing how quickly she’s bounced back,” she says. For her part, Shannon, who turned 18 in August, says she feels great and doesn’t feel the surgery has affected her ability to function in any way. 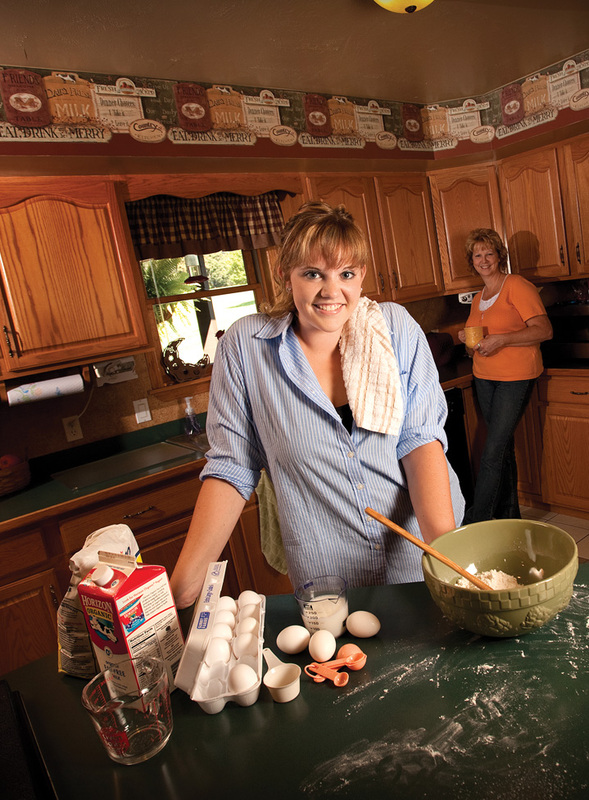 Just a few days after her 18th birthday, Shannon started in a nursing program at Butler Community College. She says her experiences as a patient convinced her nursing would be a rewarding career. “One day I’d like to work at Children’s Hospital,” she says. To read more, please visit Promises.